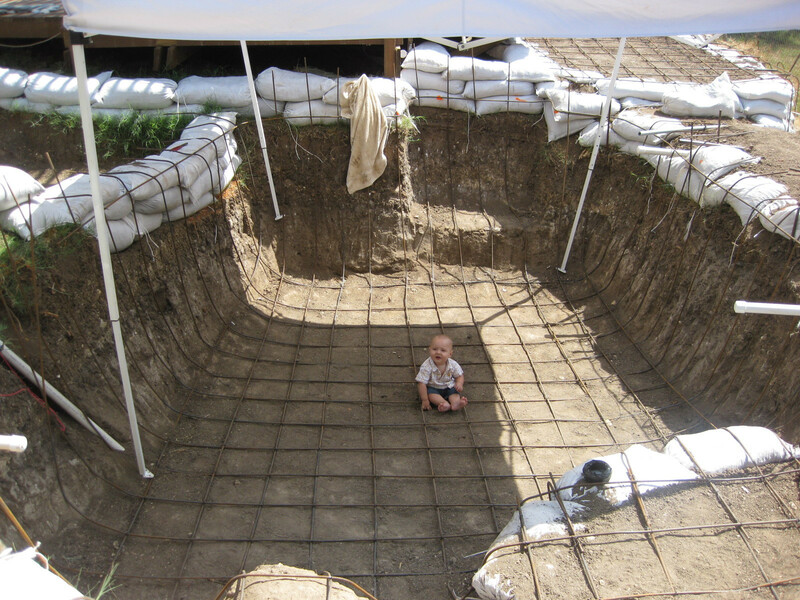 One Man Channeled His Grief Into the Most Incredible DIY Swimming Pool! It’s hard to lose someone or something that you care about. The guy were are going to talk about today loved three things: his dog, his family, and working in his yard. When his beloved dog passed away he had to do something to deal with the grief. 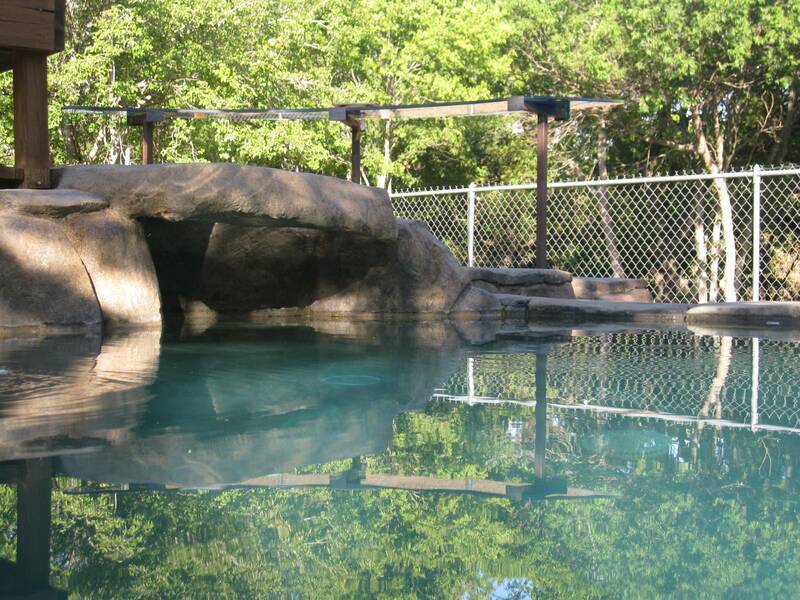 So he took an ugly hole in his backyard and decided to pour every ounce of creativity and effort he had in order to turn it into a swimming oasis in memory of his beloved pup. Here are the steps our heroic DIY builder took and you’ll be incredulous at how it all turned out. 34. You can’t do anything without a plan. 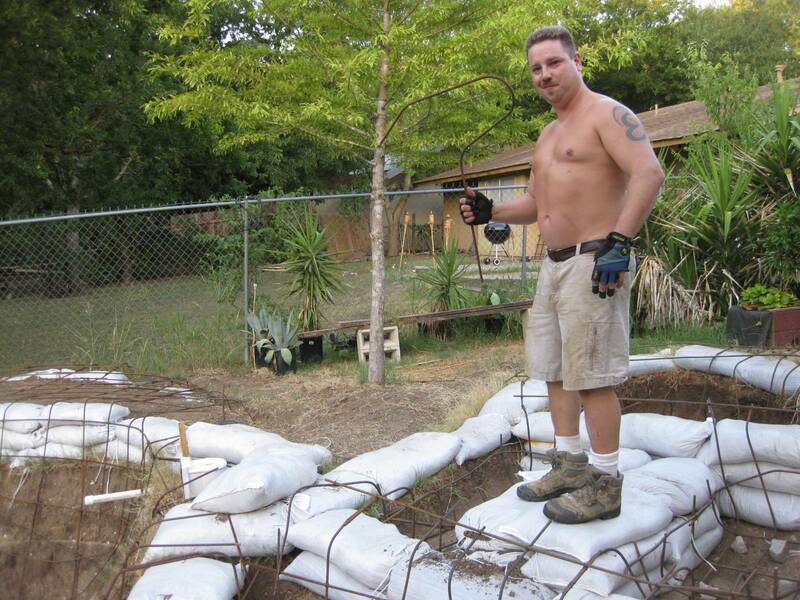 Our builder said that he deals with grief by working out in the yard. If he was going to work through the loss of his beloved pet then he would need quite the project. 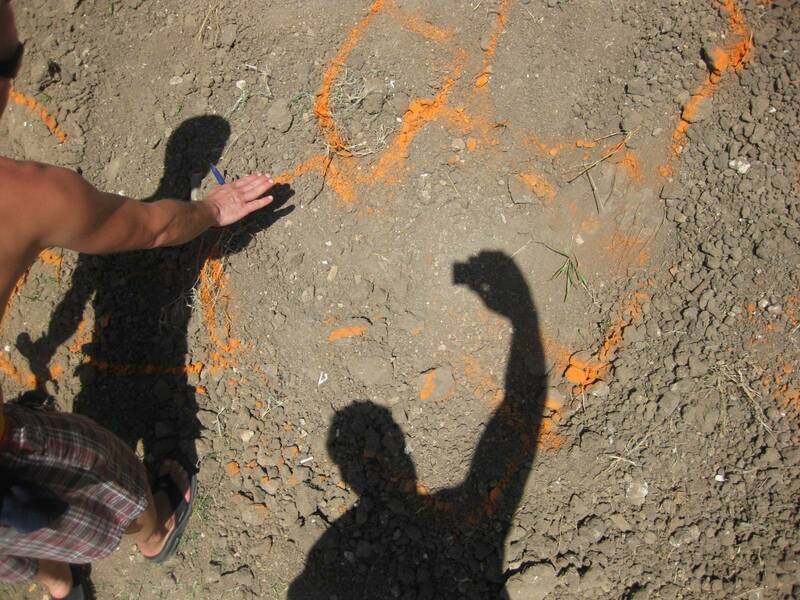 Here we can see his rough plan for his concrete pool oasis. There’s a lot of work to do here and a lot of ground to cover. 33. He started with a less than impressive hole. 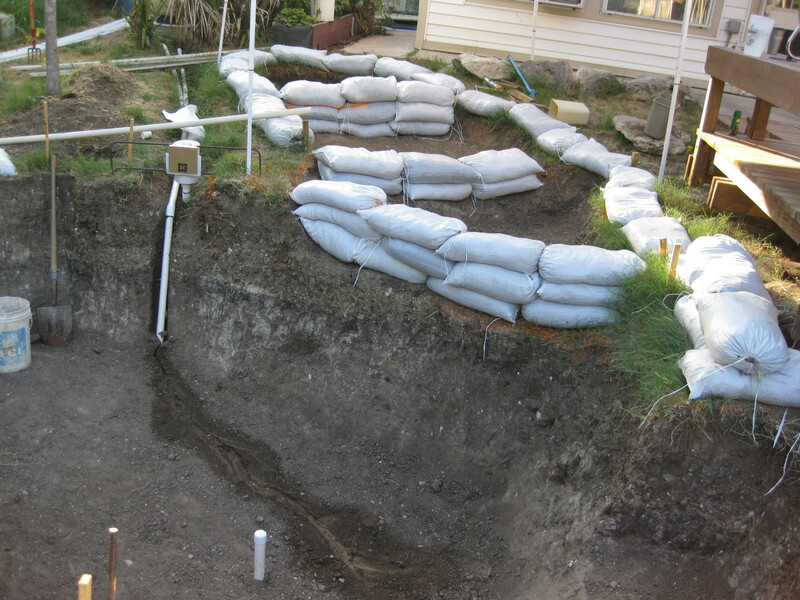 Initially his plan had been to dig up a relatively simple koi pond. This is the extent of his progress on that project. Not too impressive, right? He ultimately decided that a bigger project was in the works: the pool we showed you above. Now let’s get our hands dirty and follow his journey. 32. 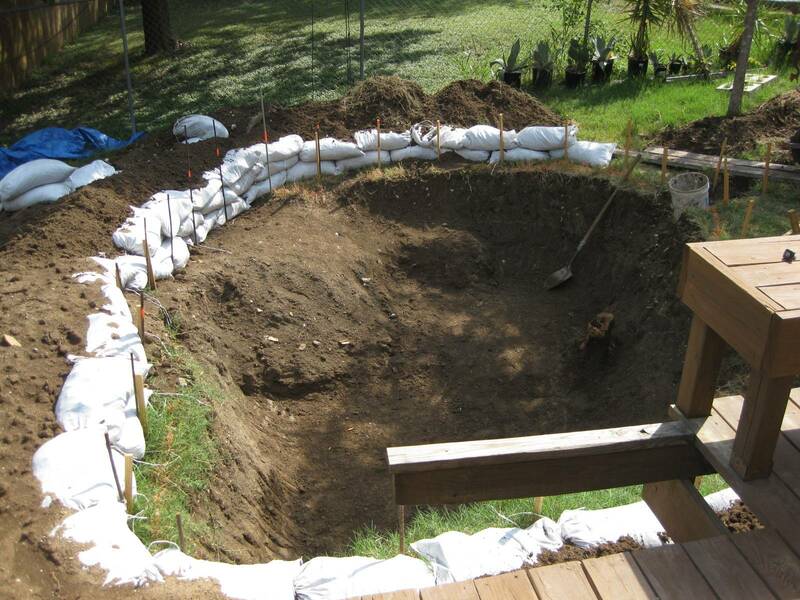 A big project would need a big hole. If you want a pool that’s worth anything then you need to make it big enough to enjoy. 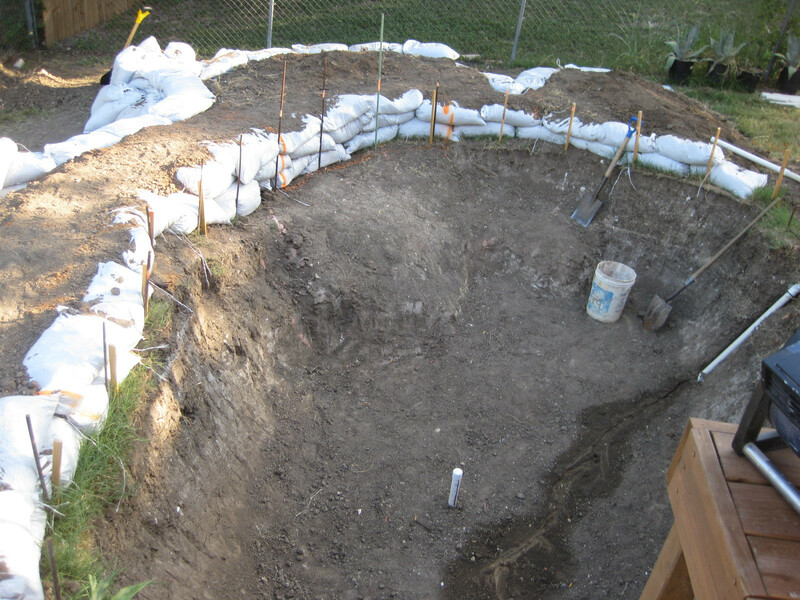 Our DIY expert decided early on that he would do as much by hand as possible — including the digging of the hole. Sweat can help keep your mind off of tough thoughts. 31. Sloping issues lead to a reinforcement wall being built. Apparently it is just as important that you keep the water in the pool after it gets built. Due to sloping concerns we see a reinforcement wall built. 30. It’s time to level off some points. 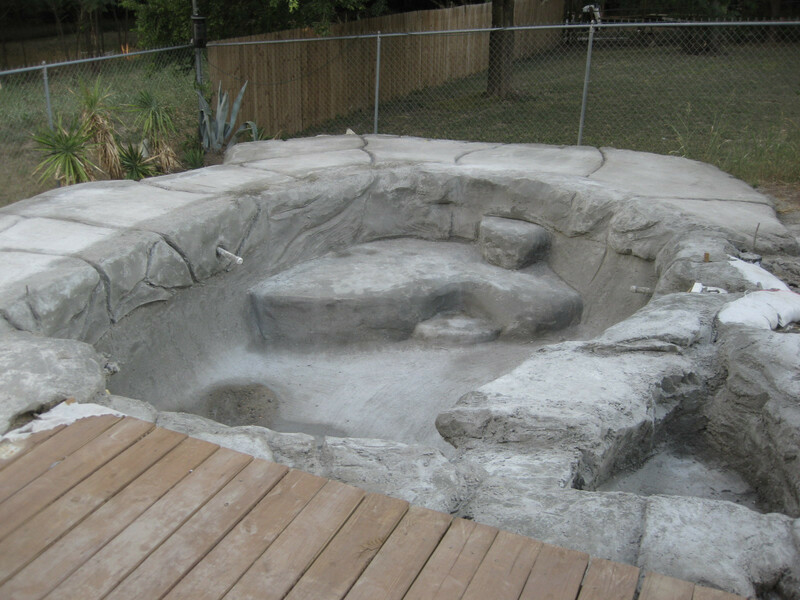 His goal wasn’t just to create a pool, he wanted to create a real oasis themed swimming hole. So here we see various leveling markers to help keep the different depths in order. This thing is going to get big. 29. A pool will need plumbing. This isn’t a natural spring we’re talking about, so water had to be pumped in. Here we see the very beginning of the extensive and expensive plumbing system that was to be installed. He saved money by doing it all on his own. 28. The engine of the plumbing system. 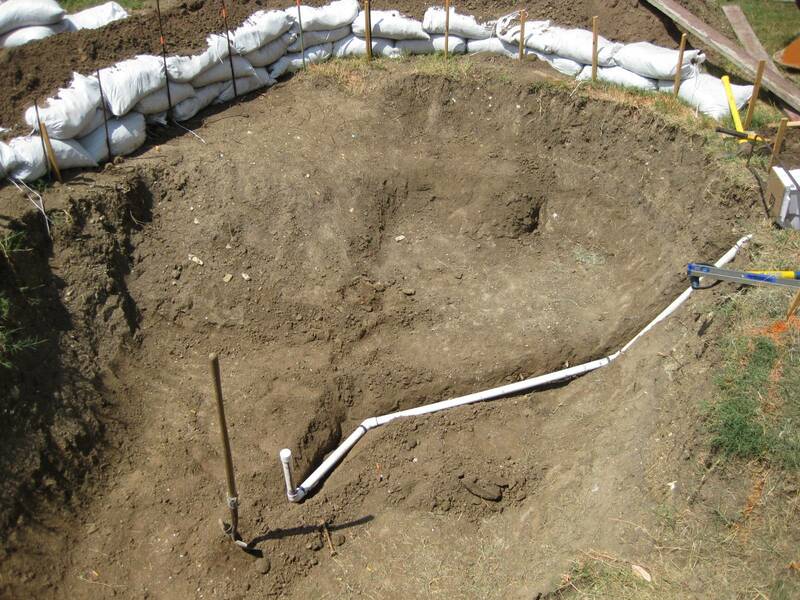 Your pool isn’t going to work very well if you don’t have a strong enough pump to keep it going. 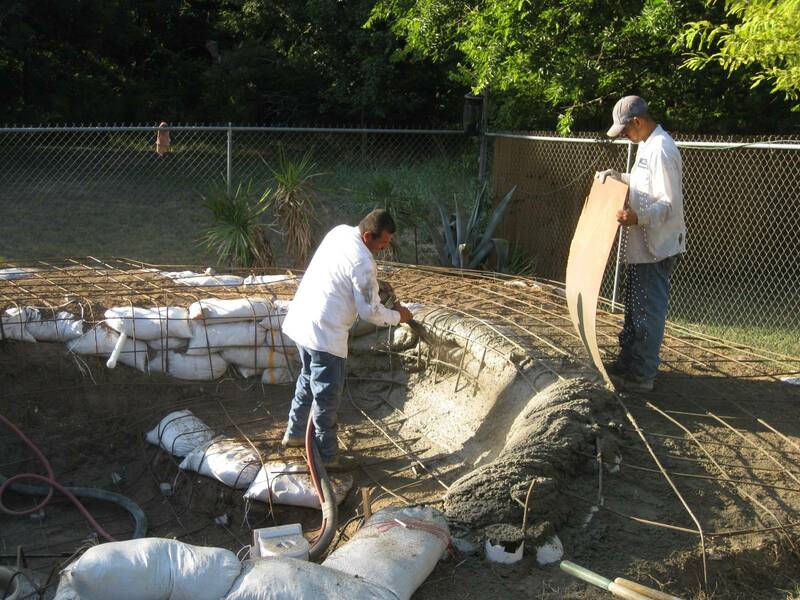 here we see a powerful water pump installed into a concrete slab for extra protection. 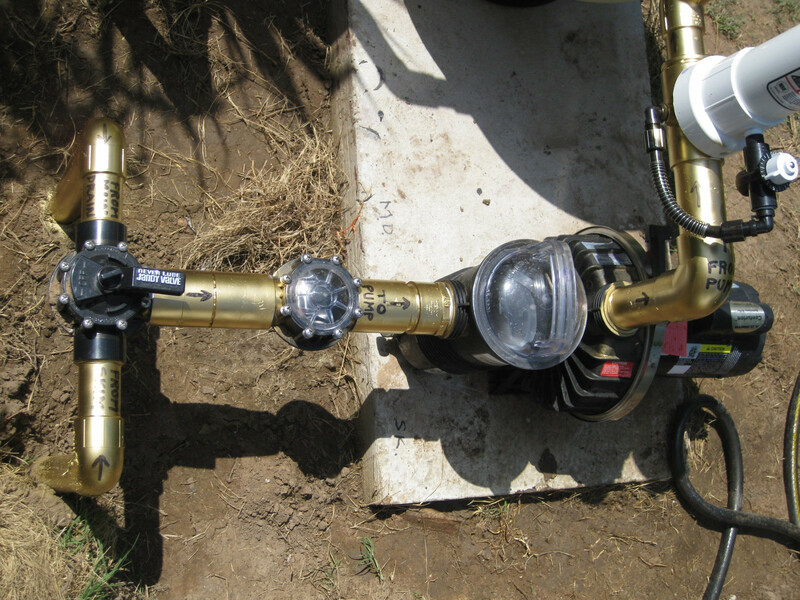 The pump was installed early into the process. 27. Protection from the Texas sun is required. Work began on this project during July. In Texas, the average high in July sits around 94 degrees. Tarps were erected to help prevent our hard working people from passing out in the sun. Many cases of beer were brought on site, as well. 26. Another shot of our retention wall. 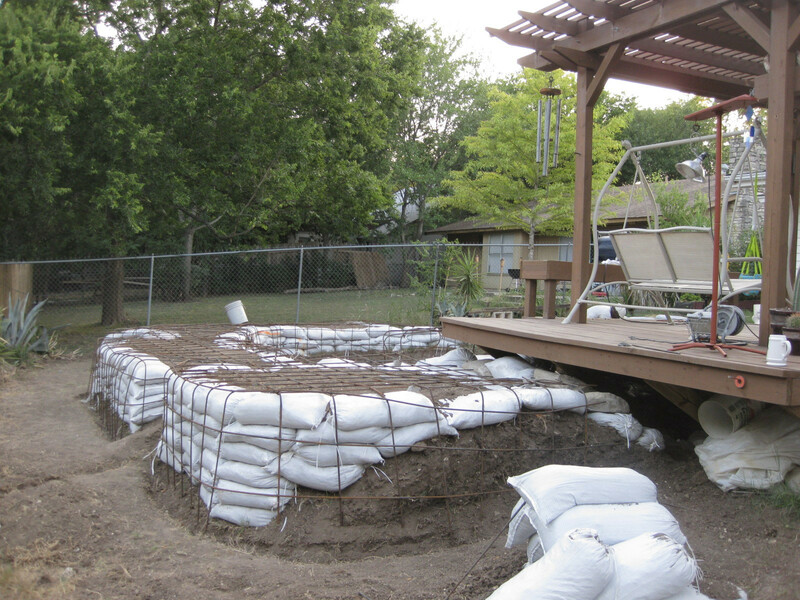 In order to level off his pool in a sloped yard, he had to build a hefty retention wall. Each bag of sand weighed at least 20 pounds. That’s a heavy, heavy wall that had to be carried in. 25. Discharge valve and skimmer tanks are installed. To keep the pool safe to swim in and clean enough to enjoy there had to be a focus on important features such as this skimmer tank. 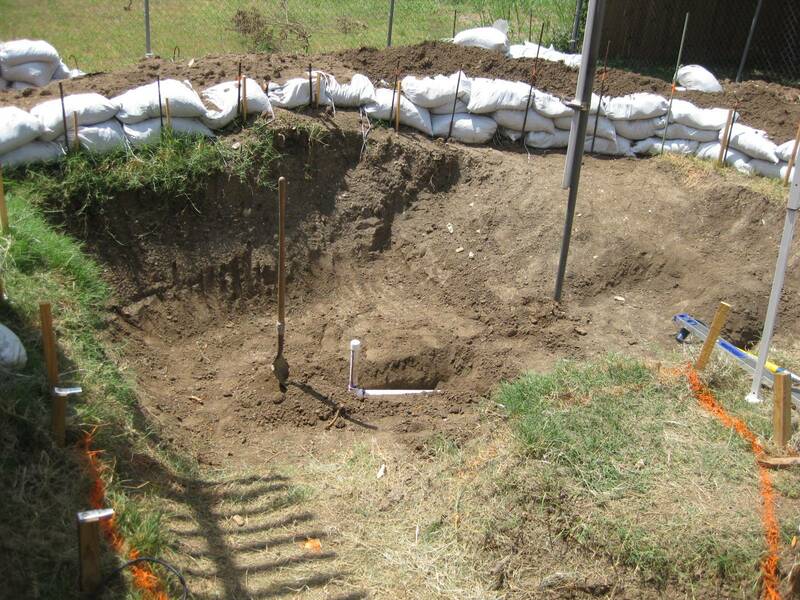 This is also where the pool will discharge when needed. 24. Did someone mention a cave? Go back to the original ‘plans’ slide. You see that little grotto there? The cave begins to take shape. It quickly becomes one of our favorite features in the entire area. 23. Dirt, dirt, and more dirt. Bucket by bucket our team hauls out incredible amounts of dirt. Some people would have turned to an excavator, but not our crew. Hand over hand, sweaty day after sweaty day, the pool is born. 22. Here’s another shot of the cave. 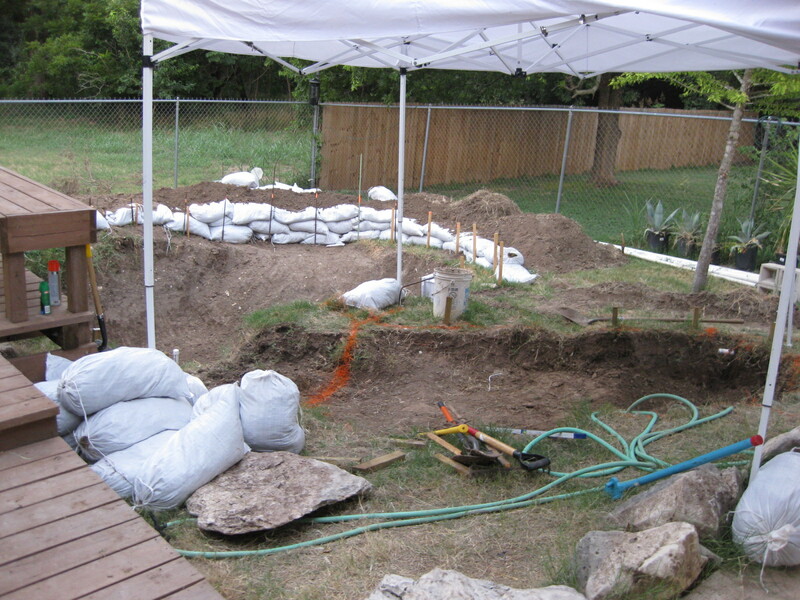 At this point, it looks like our grotto might be finished before anything else. We’re excited to see how the overhang looks when it is installed. Here you can just barely see the indentation of the cave in the wall. 21. We’ve begun the rebar phase. Before we can move into the concrete laying phase we have to lay down some rebar frames. 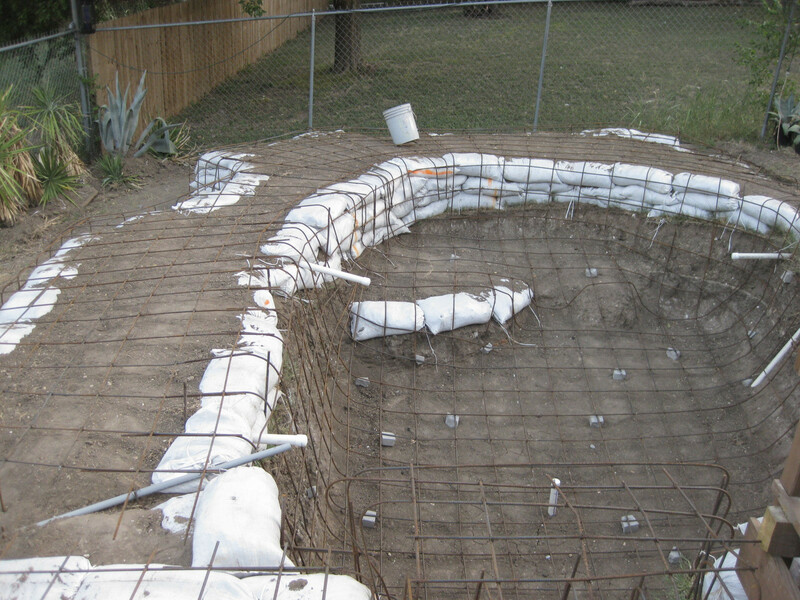 Here our builder uses 8 x 8 rebar squares in order to outline his work of art. The frame, which spans the entire project, was installed by hand. Try bending that much rebar in 100-degree weather. No thanks. 20. The retainer walls are locked in. 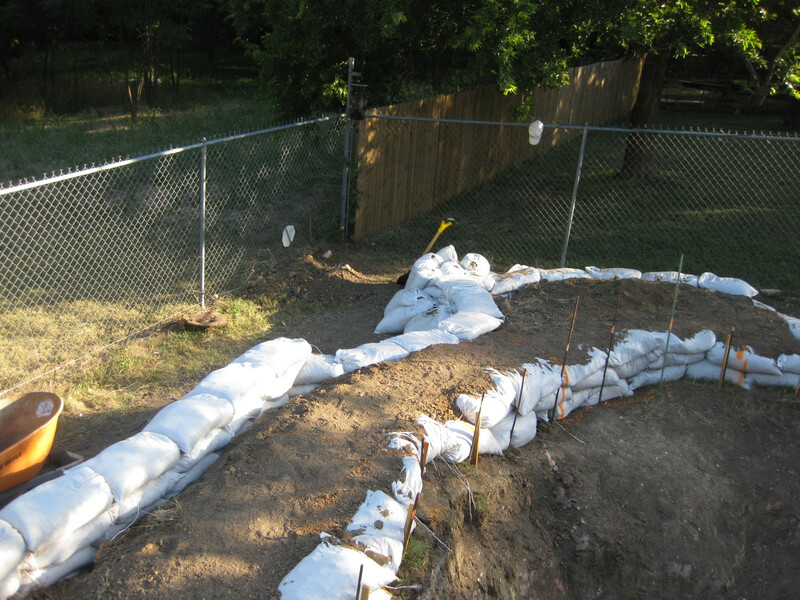 Bet you didn’t realize that those sandbags were here to stay. Here we see the rebar frame locked in around the walls. 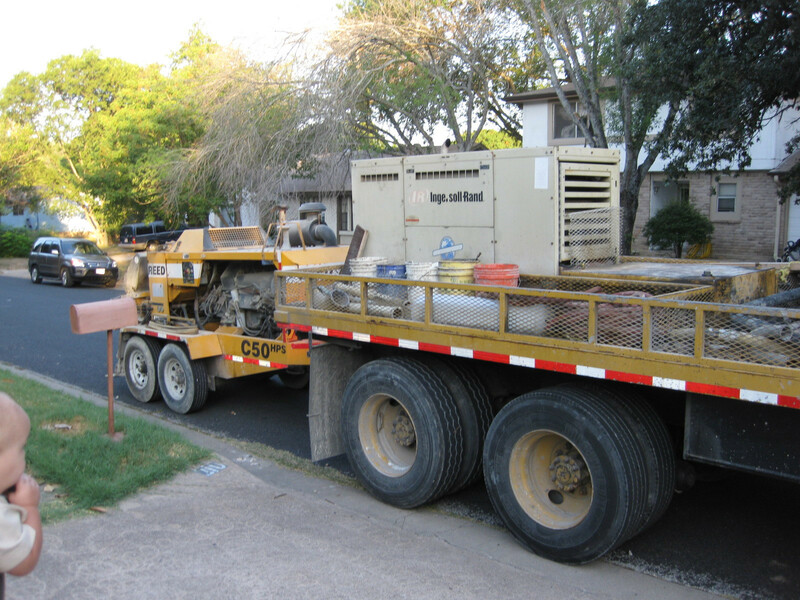 We are inching ever closer to renting out our Shotcrete machine. 19. The rebar grid from above. The pool has turned into a stainless steel hazard. Here we can see the grid from above. 18. The oasis sits in four distinct parts. 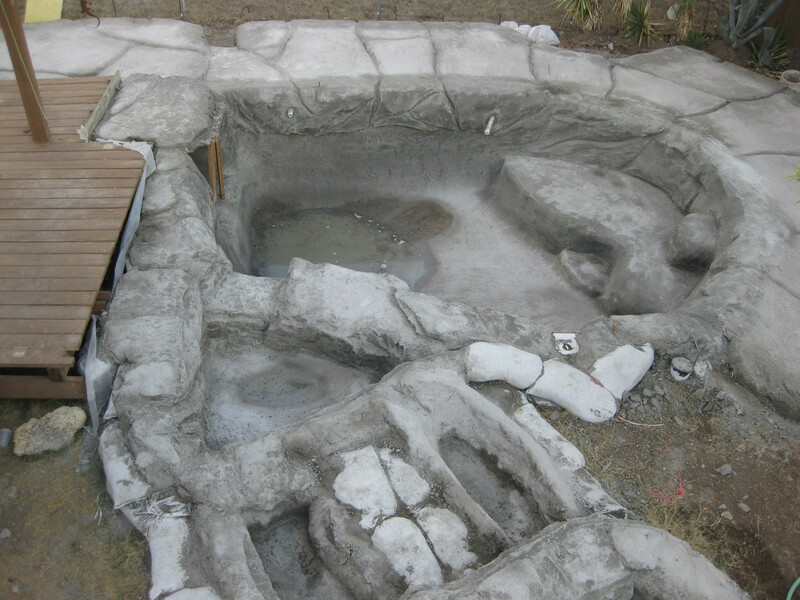 While the oasis will be used by the whole family we can see that there are two kid-friendly spots right near the deck. We’ll see his kid enjoying these later on. 17. With his enemy: rebar. Our oasis building hero is quick to admit that bending rebar is his least favorite pat of the job. He admits that he would rather dig than deal with it. Still, gotta do what you gotta do. 16. Hm, he’ll grow into it. 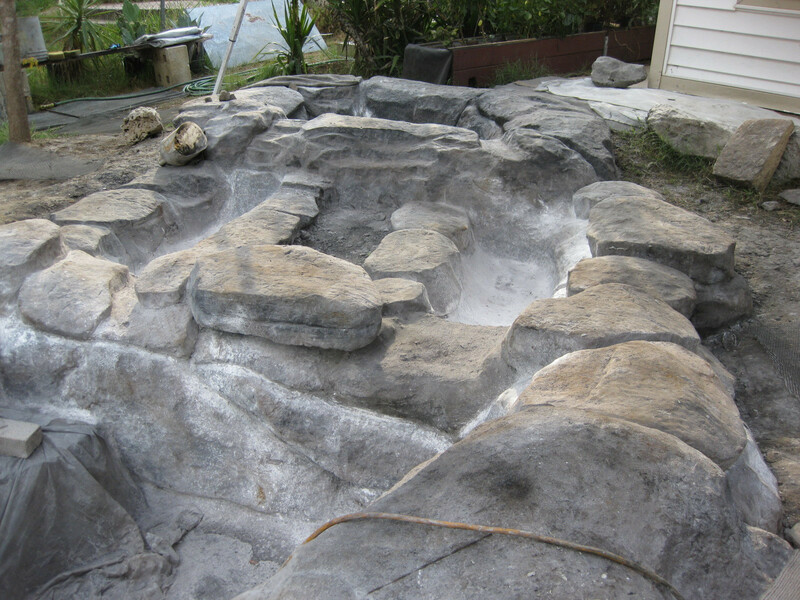 Our DIY expert wanted to make the oasis something that his kid could enjoy and make memories at. Here we see that he’s still a few years away from really enjoying the main part of the pool. 15. Our builder knows his audience. We can only assume that this furry little monster wasn’t that helpful. 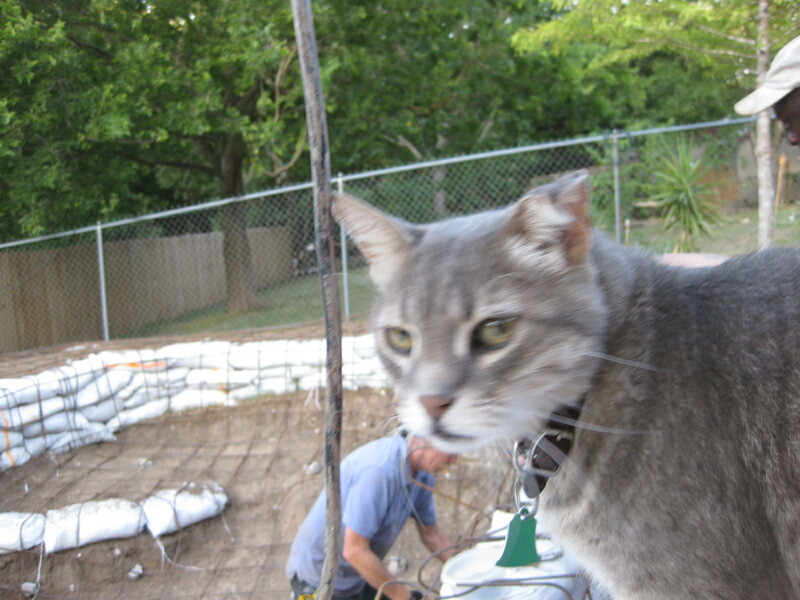 Still, here’s a shot of the cat snooping around and wondering what these humans are doing to his yard. 14. The Shotcrete arrives. You know what this means. 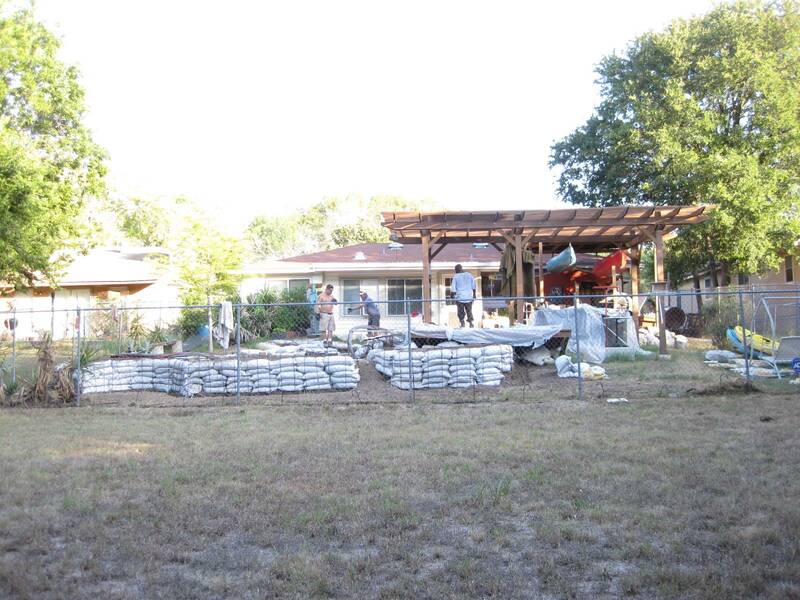 A month into the construction process we are ready to start laying down some concrete. Here we see that the team opted to rent out a Shotcrete machine. Prices vary for something like this but you are about to see that it is definitely worth the money. 13. Setting up the Shotcrete commences. Our team is ecstatic to have some automation around to help them out. Here we see the gang getting ready to spray down the first layer of concrete. 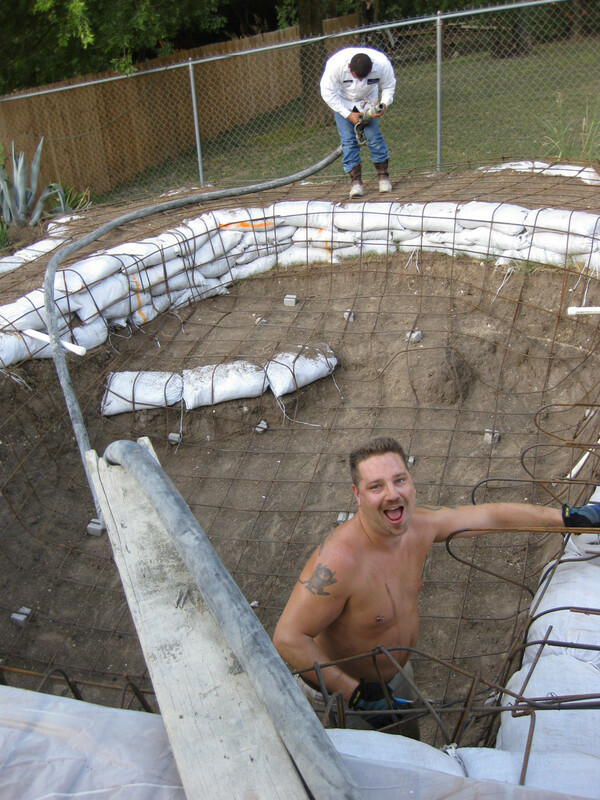 This is the phase that takes us from a metal filled hole into the realm of actual pool construction. 12. A wide view from the yard. Here we have the whole crew on location as they get ready to make some serious progress. We can only assume that everyone involved has swimming privileges whenever they want. This view is from the other side of their fence. 11. And here we go! 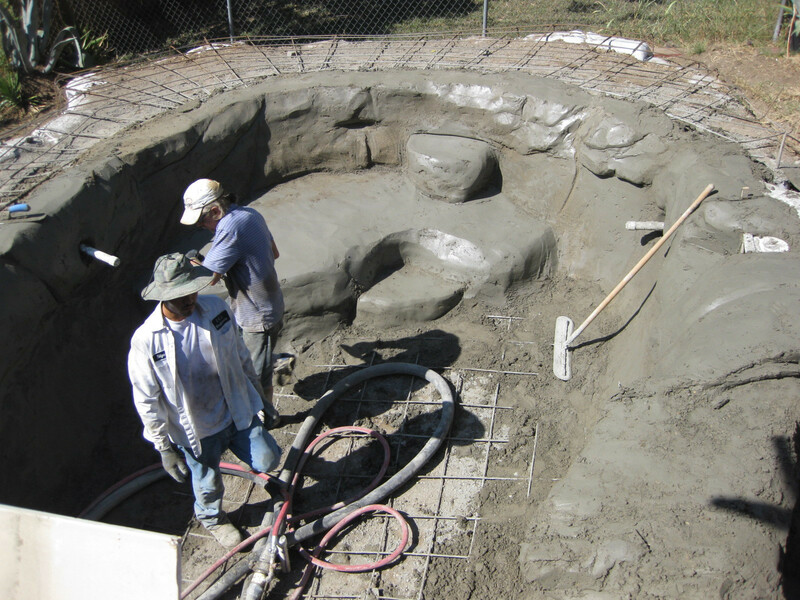 Before you know it the Shotcrete is all warmed up and the pool is starting to take some serious shape. You can already see how the concrete is going to turn this project around. This is probably the most efficient day of work on the entire project. Machines, man, they make the difference. 10. Concrete layers are done in sections. Despite how high powered the machine is the crew still needs to take their time going over every section. 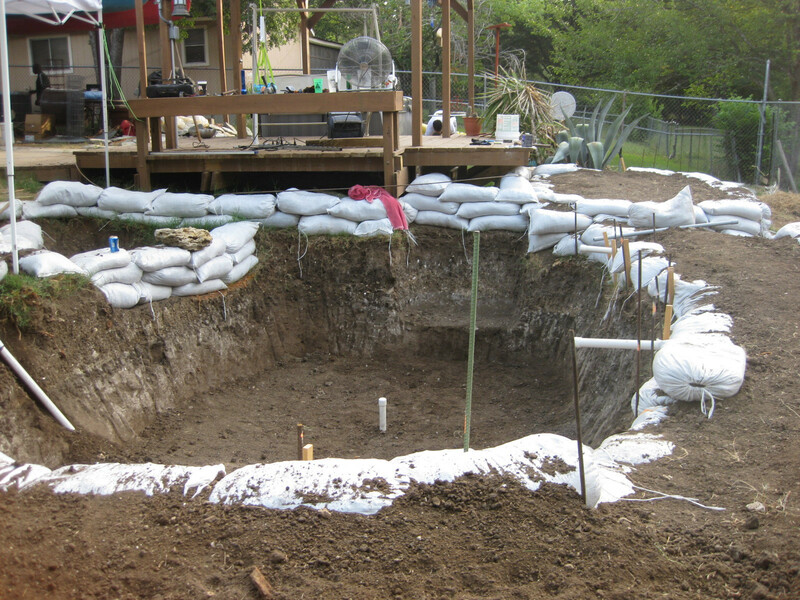 After all, once you fill the pool up with water you can’t really go back to this phase. The crew has to do it right the first time. 9. Aerial view of some major progress. Hats are a must in the Texas sun. Here we see that the crew is painfully close to the finish line during the concrete applying phase. 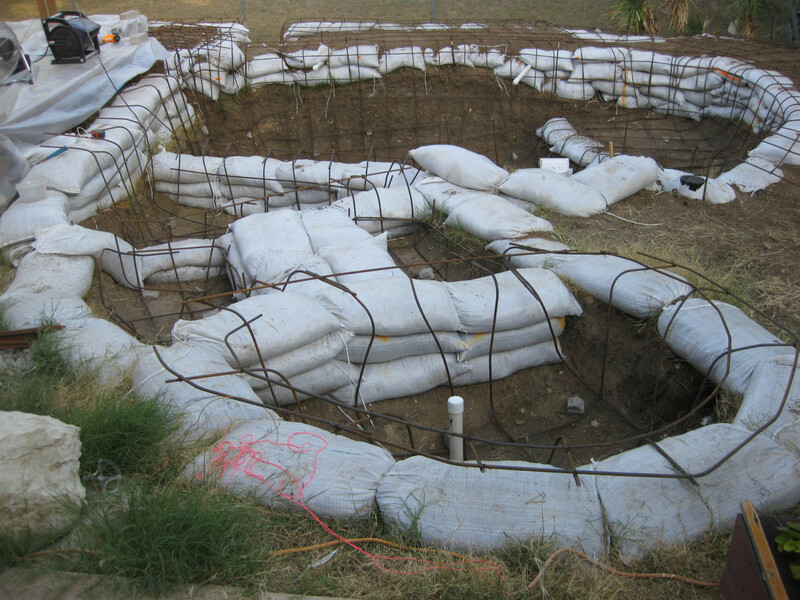 We’d estimate that the pool is 90% done at this point in terms of concrete layering. A week after the concrete is put down we have what looks to be an actual pool on our hands. At this point in time the crew is just itching to fill it with water and jump in. Yet, we still have a few more steps to go before that can take place. 7. He wanted a natural, rocky look. 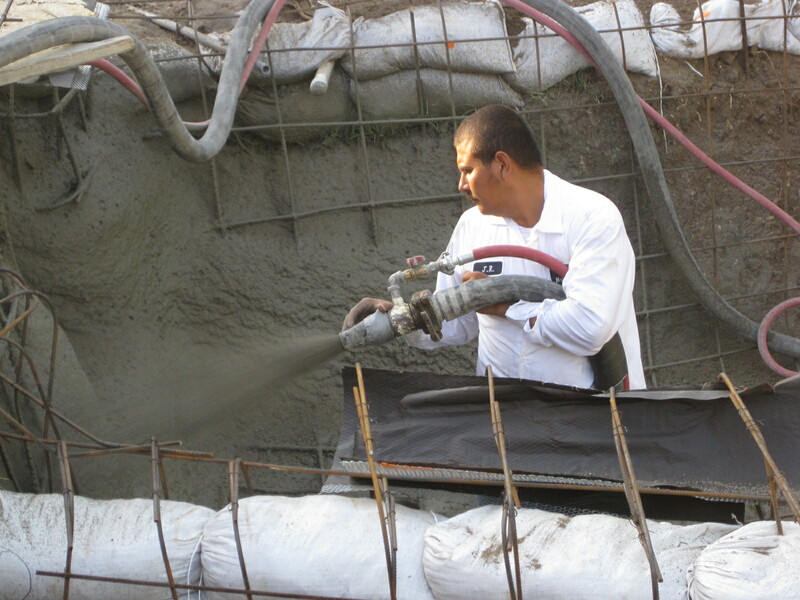 Theroseal was used to seal in the concrete to make it waterproof and long lasting. Each bag of Theroseal covered about 100 square feet and it took him three rounds of coverage in order to get finished up. Each bag was roughly $30 but this was far cheaper than some of the other options available. 6. Discharge tank, child area, deck view. Here we see how the pool is going to attach to the deck. The two small holes adjacent to the peak of the pool are designated the play area for the little kid in charge. Here we get our last view of the pool before it is filled with water. This shot was taken from the roof of the house and it shows just how expansive the project was. 4. Guess who gets the first dip into the pool? With the pool filled our hard working leader gets to take the first jump in. After about 6 weeks of work, and many long days, it has to feel good to be finished. 3. Like father like son. His first dip into the pool is a resounding success. 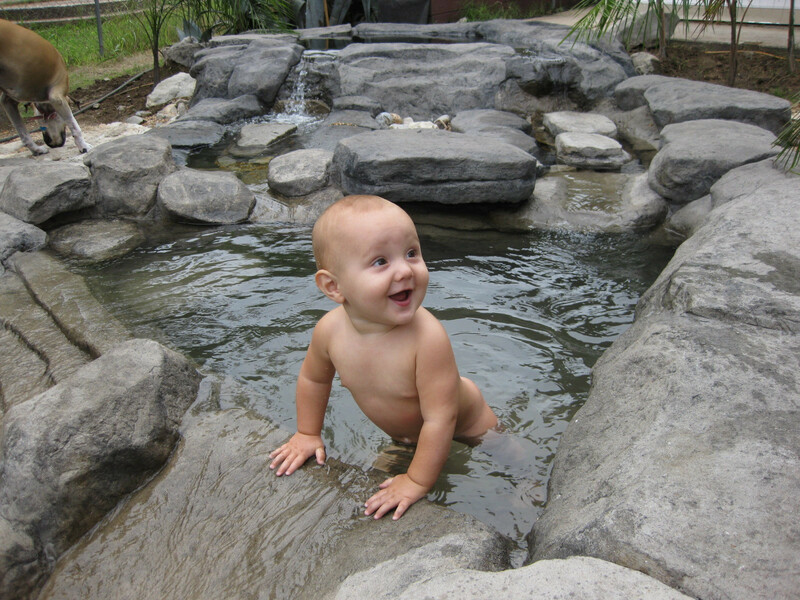 We can already tell that this little guy is going to grow up loving the family pool. Just think of the memories he will make here. 2. The cave is glorious in its completion. 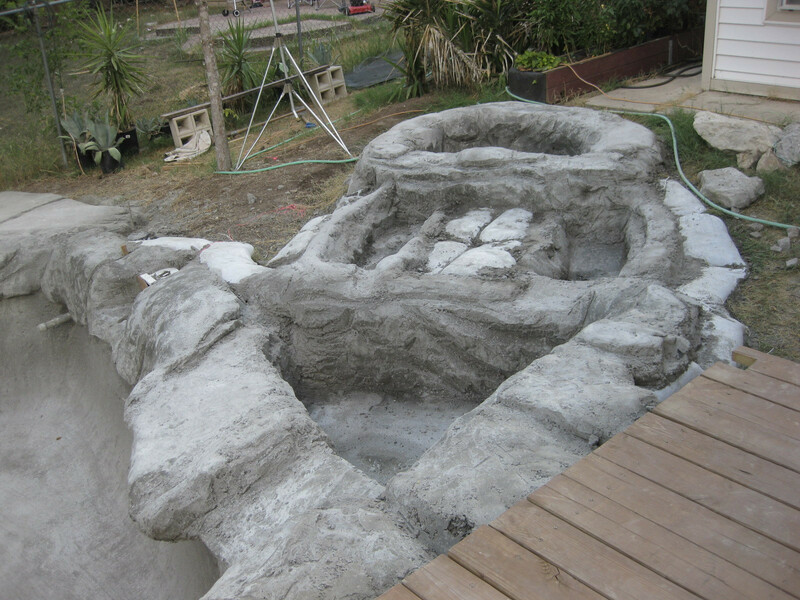 Didn’t we tell you that the grotto was going to look amazing when it was finished? 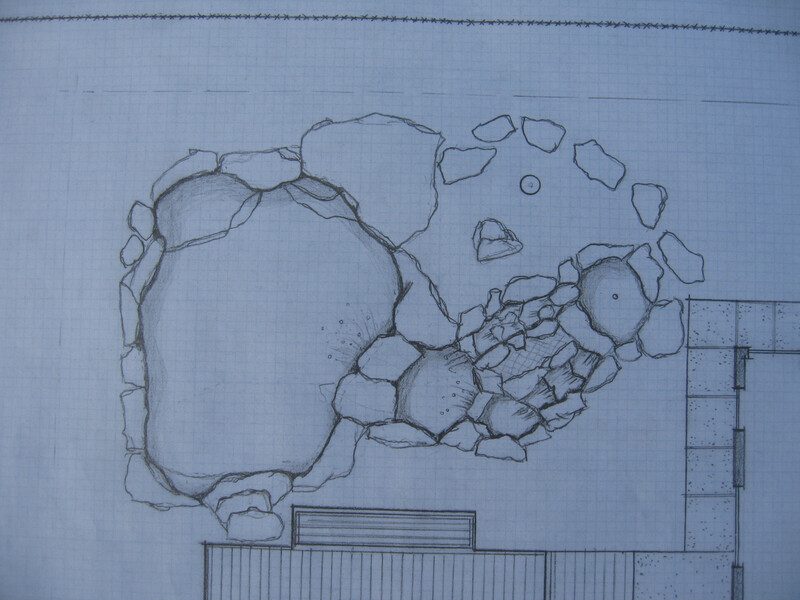 The addition of this little cave really takes the backyard oasis concept to the next level. With a little landscaping done we have a backyard to drool over. 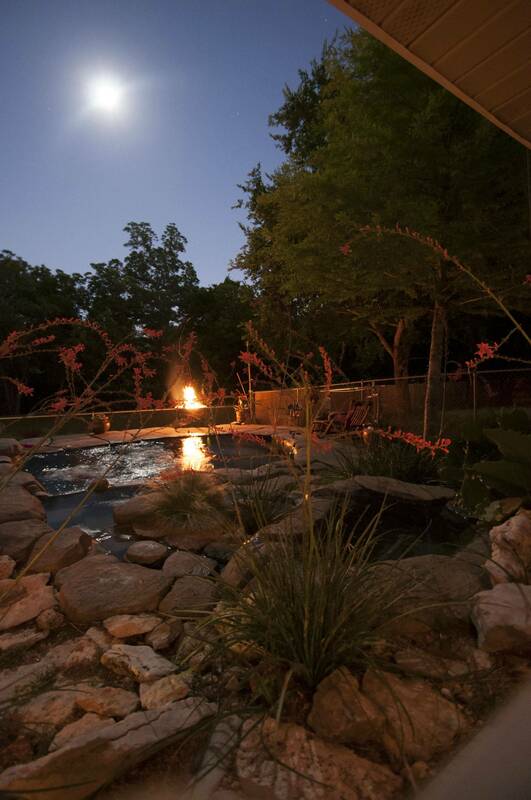 The beautiful fire pit frames up the background and reflects a shimmering glow in the hard fought pool. Grief fueled this project but all we see is love. Viral and trending stories for your insatiable web addiction! 45 Insane Camp Spots: How On Earth Did People Sleep Here? Couple Renovated School Bus Into A Home Just Right For Them! Copyright © 2016 ViralPursuit. All rights reserved.